Several mills are known to have existed in Stokesley, the first recorded being mentioned in Domesday Book. However, one of the most interesting, and still standing to the south of the River Leven, is the nineteenth century Stokesley Flax Mill which was set up by the Mease family and is the subject of one of the initial 3 leaflets published by the Heritage Group. To see a timeline associated with this mill, click on the word Timeline below; click on Sail Cloth and Sails to see one use of flax in the nineteenth century or on Linen Production in the UK in the1940's to find out about flax use locally during the war years. Sail making was an important activity at the Port of Stockton, and is likely to have provided a significant outlet for Stokesley’s Flax Mill. The following note provides background on this subject. My interest in flax is motivated by my studies of the history of cargo sailing ships of the late 19th and early 20th centuries, particularly those engaged in the grain trade from Boston North America and in the Nitrate trade to the UK & Europe from Western South America. Sails would not be made at the place of flax manufacture but sometimes on the actual vessels to the design of the captain and the on-board sail maker; such sails were all hand stitched! Sailcloth for British merchant vessels was made up in ‘bolts’ which were 16 or 24 inches wide and 40 yards long. This cloth came in 5 different weights varying from 1.5 to O.85 pounds per yard ram of 24 inches width. The various weights were needed for the different sails and weather conditions i.e. Wind expected [heavy for Cape Horn(!) or lightweight so they will ‘set’ more easily. publisher Brown, Son and Ferguson, Glasgow 1946-1979. I find no mention of British merchant navy sail cloth in Hutton Rudby Industrial Village by R.P. Hastings, although mention is made of British Admiralty Blue Line sail cloth which I think was a different weight & bolt size and could perhaps have been treated to make it fire retardant. For some coastal merchant vessels - particularly Thames Sailing Barges - sails were taken off the vessel and then soaked with sea water and laid out on a smooth field. They were then coated with a mixture including Red Ochre and Linseed oil which was brushed into the cloth with a yard broom. This would give the sails their distinctive colour and make them supple and easier to set or furl (necessary as these tasks were often done single handed). The sails of Tall Ships were not treated. Linen production in the Second World War. This region of North Yorkshire made an important contribution to the supply of linen products needed during the Second World War, as described in this note by Peter Jopling. During the Second World War my father [Harry Jopling, farmer] was a voluntary member of the Agricultural Executive which was part of the Ministry of Agriculture. His job was balancing cropping each year to allow for climatic and political changes of policy: for example, a poor harvest year meant more wheat the following year; a dry year affecting milk yields meant more grass for milk for schools; one year [possibly 1942], more barley to brew beer to boost the morale of the fighting forces. Linseed for flax was included in the schedule, with one field grown at first on Grey Towers Farm near Poole Sanatorium, off the Stokesley-Guisborough road. 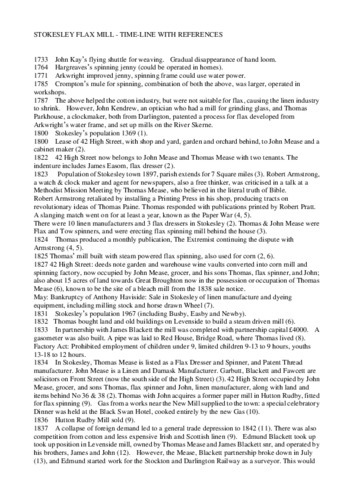 The Ministry of Supply in its wisdom envisaged a large demand for linen of various types for military needs and because of the delicate position with Eire [Irish Free State] it built its own special flax mill. This was situated about 8 miles from Thirsk, just north of Easingwold on the A19 road to York. Flax from the UK and Ireland was delivered in a raw and unbleached state as a chemical process was used to reduce the plant fibres to a state suitable for weaving. The mill produced ammunition belts for machine guns , parachute harness for aircrew and Para troops, seat belts for aircrew, uniform ribbing, packs and kit bags etc. etc. Upon closure after hostilities it was eventually taken over by Bransby Agricultural Trading Association whose name is still on it.